What is the 2019 #fussycuttingsewalong? 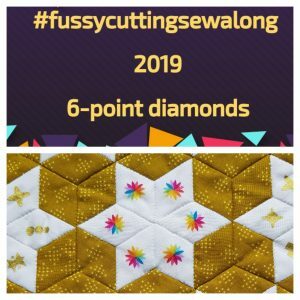 The 2019 #fussycuttingsewalong is an Instagram based sewalong which focuses on weekly prompts for fussy-cutting 6-point diamonds using English Paper Piecing. There is a new theme every month. 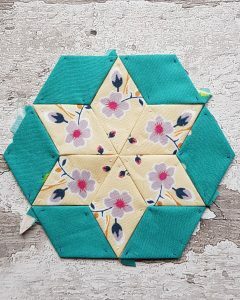 Every Monday I share a photo of a 6-point diamond star and provide fussy cutting guidelines/challenges for others participating in the sewalong to create their 6-point diamond star based on that month’s theme along with that week’s fussy cutting prompt. Each week there is a different fussy cutting style associated with that overall theme (ie. , centrally placed, section fussy cutting, inner 6 diamonds, outer 6 diamonds). Themes in 2018 included love, animals, spring, favourites, flowers, summer, travel, autumn and Christmas . 2019 will also bring some new themes…. English Paper Piecing (or EPP for short) is a patchwork technique which involves paper templates. You place the paper template onto the wrong side of your fabric and baste the template (either with thread or with glue) so that it is held in place. Once the shape is secured on all sides, you can remove the paper piece and reuse it. Fussy cutting refers to taking a specific motif/pattern on a fabric and cutting it in a way that highlights it as opposed to cutting the fabric ad-hoc. There are many ways to fussy cut including selecting a whole motif (such as a flower) so that it?s centrally placed within your patchwork, pattern matching a motif so that when your patchwork comes together the original motif has been re-created in a way that flows from one shape to the next, or choosing to only fussy cut a section of a motif (so the original motif is no longer distinguishable) in order to create a whole new design. What will the format for the year be? Every Monday I post a photo on Instagram showing that month’s overall theme, that week’s fussy cutting style and an example of a fussy cut 6-point diamond star. Along with the photo, I post written instructions which include explaining the month’s overall theme and explaining that week’s fussy cutting style. Sometimes, there are specifics for that week’s fussy cutting style so it is important to read all of the post because you have to have met each week’s prompt to be able to enter the competition at the end of the month! I try to keep to a regular format so that people can know roughly what to expect. I don’t want it to be hard or add unexpected surprised as the aim is for the sewalong to be an accessible, consistent, fun and creative activity! So, whilst there will be some variations (such as freestyle weeks), you can roughly expect each month to include the following: central motif inner 6 diamonds, section fussy cutting inner 6 diamonds, central motif outer 6 diamonds and section fussy cutting outer 6 diamonds. So, let’s look at layout options for piecing your blocks on a weekly/monthly basis! Say our theme for the month was ‘flowers’ and in week 1 the prompt was central motif (inner 6 diamonds) and in week 3 the prompt was central motif (outer 6 diamonds). Option A – for week 1, you could fussy cut your inner 6 diamonds and then add a plain fabric to your outer diamonds to make up your block. Similarly, for week 3 you could fussy cut your outer 6 diamonds and place them around plain inner diamonds. Using option A would give you 52 blocks by the end of the year. I like this option as I think it makes the fussy cutting stand out and using the same colour plain could really help to bring all of your blocks together. Option B – for week 1, you could fussy cut your inner 6 diamonds and then WAIT to make it into a block. 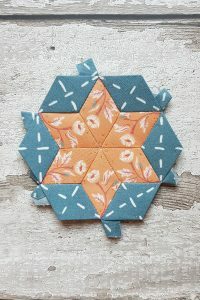 When we fussy cut central motifs in the outer 6 diamonds (for week 3) you could place these around your week 1 inner 6 diamonds to create your block. This is a great option for combining all of your fussy cutting but it will mean you have only have 26 blocks at the end of the year (rather than the 52 blocks you’ll get if you follow option A) and it may also get slightly trickier if there is a 5 week month as you then won’t be able to match the weeks together (unless you match it with another 5 week month). Option C – do it your own way! If there is another layout option that you like for using your fussy cut 6-point diamonds then please do go ahead and use it! 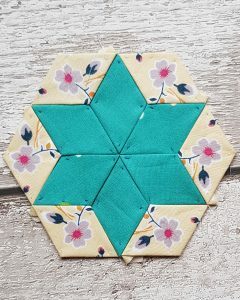 Option A – fussy cutting your inner 6 diamonds (for week 1) with a plain fabric for your outer 6 diamonds to make up your block. Using option A, you will have 52 of these blocks by the end of the year. Option A – fussy cutting your outer 6 diamonds (for week 3) with a plain fabric for your inner 6 diamonds to make up your block. Using option A, you would have 52 of these blocks by the end of the year. Option B – combining weeks together to make your final block. Here, for flowers month, I have combined week 1 (central motif, inner 6 diamonds) with week 3 (central motif, outer 6 diamonds). Using option B, you would have 26 of these blocks by the end of the year. I don’t provide the whole year’s themes upfront – I announce the following month’s theme a week before that month starts. I am not doing this to be difficult but because I want people to enjoy the present month’s theme and not to become so worried about not having the ‘right’ fabric for a theme that is 6 months away that they lose sight of the present theme. For these reasons (with there being specifics and wanting people to be in the present moment), it is important that we don’t make ahead?of?time as this defeats the point of the sewalong being that we are all sewing together at the same pace! What size diamonds should I use? This is completely up to YOU! You can use any size you’d like to use. If you are used to 1″ hexies I would recommend going no smaller than 1.5″ diamonds. If you are used to 0.5″ hexies I would recommend going no smaller than 1″ diamonds. What do I do with all of these 6-point diamond stars? For the same reason that I don’t give all the themes upfront, I also don’t stipulate what you should do with your 6-point diamond stars! The focus is on the making and the community rather than the end result! 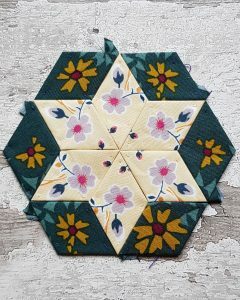 So it is completely up to you whether you wish to keep them as blocks in a box or pouch and look at every now and then to remind you of your 2019, to make them into bunting, a quilt, coasters, tote bags, zipped pouches, cushion covers, needlecases, or applique them onto existing projects! The possibilities are plentiful! What does taking part entail? For starters, it doesn’t involve signing your life away – you can join in for 1 week, 12 weeks or all 52 weeks! I want it to be fun and to fit in with you! Taking part does?mean bringing your humour, your encouragement and your willingness to invest in you! Just over half-way through the year I’ll organise a group quilt to reflect on the sewalong for that year. Participation in the group quilt involves sending me (the host) a 6-point diamond star based on a theme (yet to be decided). This entirely voluntary – you can 100% take part in the sewalong without taking part in the group quilt! This is just an added extra because it is nice to have a tangible object as a reflection of our year of creating and sewing together! Taking part also involves using the hashtag #fussycuttingsewalong on any posts related to your fussycuttingsewalong journey (this might be fabric shopping, placement advice, joining advice, progress photos and, of course, your 6-point diamond stars!) as well as tagging me into your posts with the 6-point diamond stars. Using the hashtag helps people to support and encourage one another and tagging me into your post helps people to know who to ask questions to if they’re interested in taking part. You could also use an additional hashtag to track your own progress throughout the year! So, if I wanted all of my 6-point diamond stars to be visible under the same hashtag I would use #fussycuttingsewalong but I would also use #naomisfussycuttingsewalong (my name is Naomi!) so that I can track my own progress under one hashtag! Okay, I’m really interested! How do I join? Is there a specific start date? You can also turn on post notifications so that you’ll be alerted to when I post about the sewalong (go to my Instagram profile, click the three little dots in the top right of the profile and then click ‘turn on post notifications’).